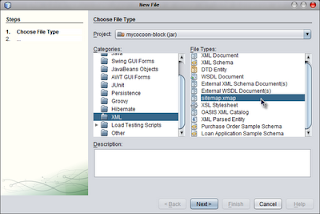 I really like to use NetBeans to develop Cocoon 2.2 applications. NetBeans has great support for XSLT 2.0, XML and Maven. And those are the technologies I use when I develop a Cocoon 2.2 application, so the choice is obvious. 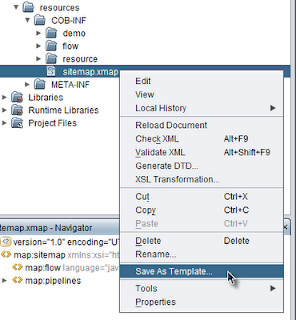 To speed up development we can make a new template for a sitemap.xmap file. Once we have a template we can select it when we add a new file with File | New File. 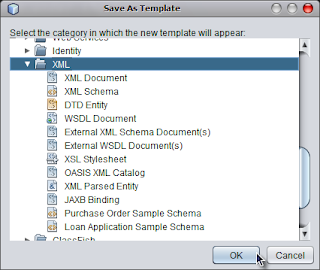 NetBeans opens a dialog window where we must select in which category the template must be saved. We select XML to save the template and then press the OK button. Now we can select the template when we go to File | New File (or press Ctrl+N in Windows). In the XML category we find our sitemap.xmap template. We can select and press the Next button. We can type a new name and the location where we want to save the sitemap file. We press the Finish button and we can start editing the new sitemap file.